Stage Stores has announced it will expand into Southern Nevada with its Bealls brand, leasing some of the vacant big box spaces in the area. The Houston-based discount chain will initially open two stores in the Las Vegas Valley — in the Tropicana Center at 3185B Tropicana Ave. in Las Vegas and in Green Valley Crossing at Green Valley Parkway and Horizon Ridge Parkway in Henderson — scheduled to open in the fall. The Las Vegas store will be 20,711 square feet and the Henderson store 20,000 square feet. The company also is looking for additional sites in the valley, according to its representative, Newmark Grubb Knight Frank. 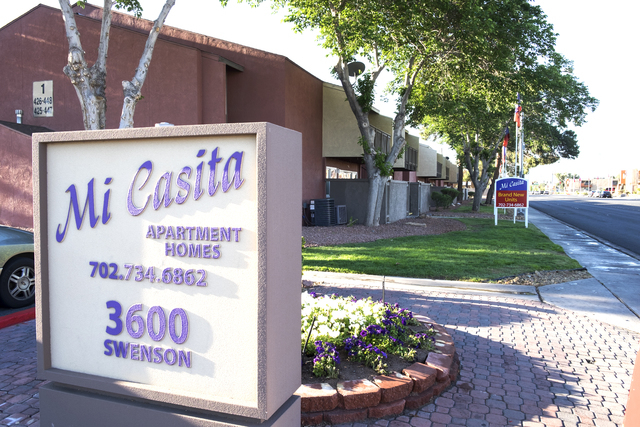 • Mountain View Equity purchased the 764-unit Mi Casita Apartments at 3600 Swenson St. and 764 Twain Ave. in Las Vegas for $30 million. Glenn Dulaine of Realty Executives of Nevada represented the buyer and the seller, Pinewood Apartments LP. • Impala LLC purchased 3.63 acres of vacant land at 880 E. Larson Lane in Henderson for $1 million. Vince Schettler of Colliers International represented the seller, NH Holdings Henderson Series. • BM Highland LLC purchased 7,861 square feet of office space in the North Point Office park at 7326 W. Cheyenne Ave. in Las Vegas for $982,625 from Jackat LLC. Suzette LaGrange and Kara Walker of Colliers International represented the buyer. • Friends of Las Vegas Orchestra purchased 1.14 acres of vacant land at 2750 S. Maryland Parkway in Las Vegas for $450,000. Steven Haynes represented the landlord, Time Square Properties LLC. • Soulfish Poke LLC leased 1,430 square feet of retail space at 8680 W. Warm Springs Road, Suite 130, in Las Vegas for 60 months and $199,657. Jakke Farley of Virtus Commercial Real Estate represented the tenant and Nelson Tressler and Michael Zobrist of Newmark Grubb Knight Frank represented the landlord, Ravan Orange Grove LLC. • Haircuts for Kids LLC, dba Cookie Cutters, leased 1,412 square feet of retail space at 7345 S. Durango Drive, Suite 110, in Las Vegas for 64 months and $166,422. Nela Anzalotti of Logic Commercial Real Estate represented the tenant and Nelson Tressler and Michael Zobrist of Newmark Grubb Knight Frank represented the landlord, DM Rhodes Ranch LLC. • JusTours Inc. leased 3,100 square feet of office space at 7885 W. Sunset Road, Suite 100, in Las Vegas for $152,892 and 36 month. Soozi Jones Walker and Bobbi Miracle of Commercial Executives Real Estate Services represented the landlord, Allen-Milan LLC. • Racing Optics Inc. leased 10,257 square feet of industrial space in the Arroyo South Business Center Phase I at 7200 Montessouri St., Suite 100, in Las Vegas. Greg Pancirov and Mike DeLew of Colliers International represented the tenant. Spencer Pinter of Colliers International represented the landlord, EJM Arroyo South I Property LLC. • Everi Games Inc. leased 10,176 square feet of industrial space in the Eldorado Business Center at 7445 S. Dean Martin Drive, Suites 121-122, in Las Vegas. Dean Willmore and Chelsey Cardin of Colliers International represented the landlord, TLF Logistics II Eldorado Business Center LLC. • JSA Healthcare Nevada LLC leased 3,684 square feet of office space in the Shadow Medical Center at 400 Shadow Lane, Suite 207, in Las Vegas. Stacy Scheer, Taber Thill, Ryan Martin and Patti Dillon of Colliers International represented the landlord, B&R Receivership LLC. • Sew Little Time leased 2,700 square feet of retail space at West Sahara Town Plaza at 6358-6360 W. Sahara Ave. in Las Vegas. Neil Dela Cruz and Oliver Kruaprasert of MDL Group represented the landlord, West Sahara Associates. • Kirk Mobile LLC leased 2,687 square feet of industrial space in the Northpointe Business Center at 4240 N. Lamb Blvd., Suite 105, in Las Vegas. Dean Willmore and Chelsy Cardin of Colliers International represented the landlord, FJM Northpointe Associates LLC. • Dr. Maribel Monroe leased 2,200 square feet of office space at 2480 Professional Court in Las Vegas. Alexia Crowley of MDL Group represented Dr. Monroe. Dendr8 LLC was the landlord. • Paul Janik leased 1,938 square feet of industrial space in the Patrick Airport Center at 2700 E. Patrick Lane, Suite 11, in Las Vegas. Dean Willmore, Mike DeLew, Greg Pancirov and Chelsy Cardin of Colliers International represented the landlord, Stockbridge Patrick and Mojave LLC. • H.I.S. Tours USA Inc. leased 1,728 square feet of industrial space in the Patrick Commerce Center at 2875 E. Patrick Lane, Suite N, in Las Vegas. Spencer Pinter, Dan Doherty, Susan Borst, Chris Lane and Jerry Doty of Colliers International represented the landlord, BKM Patrick 102 LLC. • Psychic Arts leased 1,200 square feet of retail space in Flamingo Verde at 6020 W. Flamingo Road, Suite 8, in Las Vegas. Lisa Anderson of MDL Group represented the landlord, Flamingo Verde LLC. • Dr. Fiona Kelly leased 1,073 square feet of office space at 2920 N. Green Valley Parkway, Suite 723, in Henderson. Alexia Crowley and Jerry Hagfeldt of MDL Group represented the landlord, 2920 N Green Valley LLC. • Elite Personal Trainers leased 750 square feet of retail space at Placid Corners at 310 E. Warm Springs Road, Suite D in Las Vegas. Neil Dela Cruz and Oliver Kruaprasert of MDL Group represented the landlord, Bakolas Holings Placid LLC.